All 22 episodes of the award-winning American comedy series set in the fictional 99th Precinct in Brooklyn. Andy Samberg stars as NYPD Detective Jake Peralta, a talented but immature recruit with the highest arrest rate in the precinct. 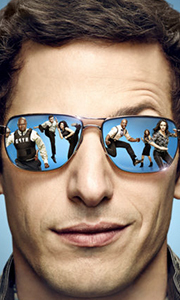 Peralta's insistence on being the precinct's funny man often puts him at odds with the uncompromising Captain Holt (Andre Braugher), who believes that those under his command should obey protocol at all ..
Own Brooklyn Nine Nine Season 3 DVD from Deff, DVD, Blu-Ray & 4K Video Specialists - Free UK Delivery..
Own Brooklyn Nine Nine Season 5 DVD from Deff, DVD, Blu-Ray & 4K Video Specialists - Free UK Delivery..